Vigorous shrub with bright green soft foliage on tall erect stems. Stems are covered with whorls of vivid orange flowers in autumn. 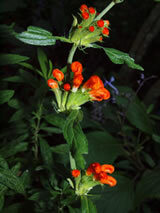 Plant in well drained soil in semi-shade or sun. Best to prune stems back very hard in early spring to maintain a tidy bush. Wonderful colour at the back of a border.